New to the ski quiver this season is a pair of Fischer cross-country skis. I also acquired some boots. Poles too. REI calls it a "package" and gives you the whole kit and caboodle for a discounted rate over the individual items. It was a truly white Christmas in the Chicago area and so I was quite happy to be able to put the new package to work right away. 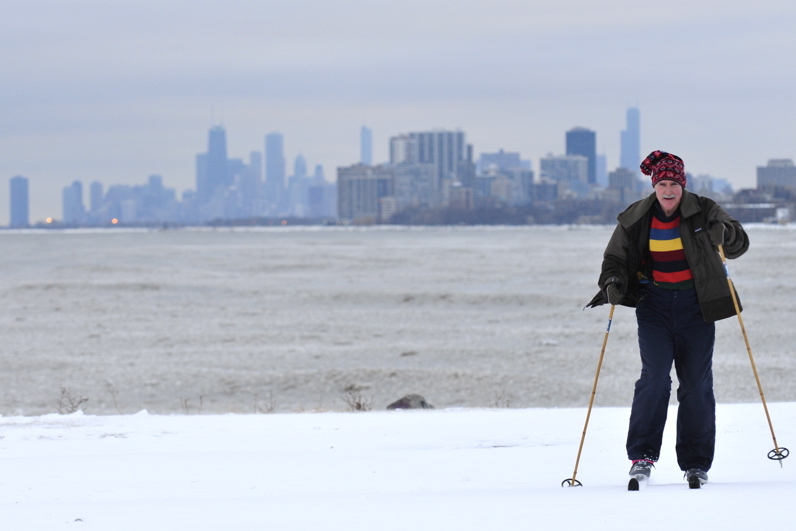 My dad and I headed down to the shores of Lake Michigan and enjoyed great cross-country skiing conditions, which are few and far between in these parts. I'm more used to taking in the distant ridge lines while on skis, but the Chicago skyline isn't too shabby either. If you get lemons, make lemonade. If you live in the flat-land, get cross-country skis.